The London District of The Methodist Church – Welcome to the London District of The Methodist Church. 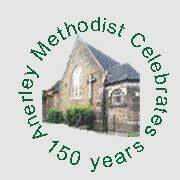 Methodist Church History Everything about Methodism – Who we are, what we believe and how we were founded – from the Methodist Church in Britain Web Site. Living Hope Project – Living Hope is a project that aims to provide good quality education for disadvantaged children in Baddomalhi, Pakistan.